The board of trustees and staff of Raymond Village Library (RVL) held a special re-dedication of the recent completed library renovations that consisted of a new circulation/check out desk. The event took place on Sunday, August 27 to honor Basil and Dia Chigas from Acton, MA as well as the many volunteers and area community businesses that gave their time and/or services. “The space was dedicated to Dr. Charles and Florence Chigas. 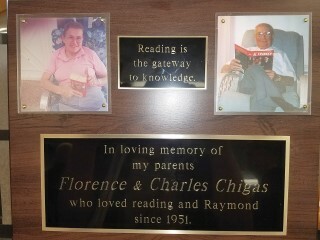 The Chigas's have been part of Raymond since 1951. Avid readers, they passed their love of libraries on to their son Basil whose donation made this space possible,” the RVL website states. Although this is a story of a husband and wife team who generously donated money in the memory of Basil’s parents, it is also a tale about a small group of people coming together to create something bigger than expected. Much like a pebble dropped into the water, the ripple effect of Basil and Dia’s donation created a community of volunteerism that made such a project, not only easily possible, but successful. Although technically, the idea and dream of a new circulation desk began in early spring 2017 when the Chigas’s approached the Board of Trustees President, the real story began over 75 years ago. Basil Chigas shared that story with The Windham Eagle. Lieutenant Chigas. Fast forward a couple of years and it’s the 1950s. The couple married and made Billerica/Lowell, MA area their home. Here, Dr. Chigas owned a dentistry practice and Flo continued nursing. Two children, a son Basil and a daughter named Martha were now a part of their lives. 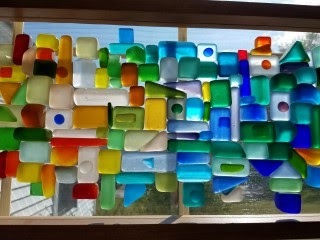 Glass Artist, Nick Hardy, donated his artwork to the library. The Chigas’s named that camp Porta Panagia. Although there are various interpretations (and a church in Greece) of that name, Basil’s father’s version of the expression is “doorway to heaven.” Dr. Chigas saw so much beauty in Raymond that he viewed this small camp and its location as his own heaven on earth. That’s when he approached the trustees of the library and asked how he could help. “We really need a new sign in front of the library,” Bourque recalls saying at their first meeting. “Think bigger” was Basil’s reply. And that’s how it all began. The new library circulation desk that caused the ripple effect of community collaboration and created an improved and updated library service that is available to encourage a love of reading among children and their families. “Their vision resulted in the community coming together that led to much, much more than what was initially asked for,” said Bourque. Not to mention a variety of volunteers with big hearts who gave their time in the construction efforts. The next time you enter the doors of Raymond Village Library, don’t let the appearance of that small quaint building fool you. There’s a lot of big hidden in those walls and foundations that has in the past and continues now, to serve the community and the world, in ways unknown. Who knows, you may just happen to enter your own version of heaven.